Wherever power flows along a wire or data is transferred along a fibre optic cable, a HellermannTyton product isn’t far away. From humble beginnings 84 years ago in Germany, the company has become one of the leading global suppliers of a wide range of products used to fasten, fix, connect, insulate, protect and identify electrical and digital cabling. Discover more about where we come from in our feature article. Paul Hellermann probably didn’t imagine just how big his 1935 Hamburg start-up would grow. The company still sells non-shrinkable tubing and three-pronged application tools based on the ones he invented to protect cable sheaths from damage. But now HellermannTyton supplies thousands of additional products used to route, fasten, protect and mark the wiring in vehicles, machinery and buildings. The company is present in 38 countries and operates 15 world-class manufacturing facilities. 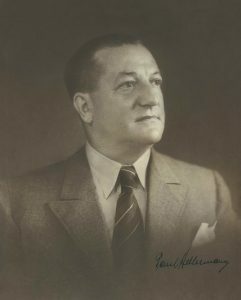 In 1938 Paul Hellermann extended his business to the UK in a joint venture with Jack Bowthorpe – who was later awarded a CBE for his service to British industry. As wiring became more complicated, Bowthorpe was one of the first people to realise that the colour of cable sleeving and a numeric system could be used to identify their purpose. The cable tie business really took off in the 1960s. The aptly named product engineer Heinrich Kabel, and head of the German site, invented the continuous strap bundling system, launched in 1965. His patented method was dubbed the ‘Tyton System’ which was an immediate hit with cable harness makers worldwide. Cables could now be bundled using a handheld pistol that looped a strap through a plastic buckle and pulled it tight before cutting it off. There wasn’t any wastage from tie cut-offs either. A related invention – Kabelrap, cable ties locked by pushing a fibre glass pin through the band with a special application tool – is still manufactured and sold as our KR-Series. Riding the wave of industrial interest in the Tyton and Kabelrap bundling systems, the company embarked on a round of unprecedented international growth. The group even incorporated the name Tyton when it renamed universally as HellermannTyton from 1999. The engineering behind the Tyton System has since evolved into the Autotool 2000 CPK, an electrically operated automatic bundling system which can even report the precise tension of an individual cable tie in critical parts of a wiring harness. But cable ties are just one aspect of cable management. As a specialist in products that fasten cables together, affix them to something, join them together, protect them or mark them clearly so that they can be identified later on, HellermannTyton is never far away wherever cables are installed. Smart homes, autonomous vehicles and industry 4.0 have moved on from being trendy monikers. Even the wireless future has to be connected somewhere – and often discretely, in half the available space or lighter than in the past. HellermannTyton is already helping customers around the globe solve the challenges thrown up by new technology. For example, e-mobility has sparked a proliferation of high-voltage power systems with cables that can generate disruptive electro-magnetic fields. HellermannTyton has been solving such issues for customers in other sectors with shielded braided sleeving for years. Depending on where wiring is installed and its function, the cable management products chosen also have to withstand mechanical strain like vibration, or the effects of weathering such as ultraviolet radiation, moisture, very low and high temperatures, the influence of chemicals, or a combination. With decades of experience helping customers across all industries overcome their hurdles, the company is a go-to expert in all aspects of cable management product design and manufacture. Many of the ideas evolve into standard products. Take for example SA47 heat shrink tubing, broadband fibre closures and connection points for easy FTTX connectivity, printable or RELICON cast resin and gel joints for reliable cable connections in the ground. When it comes to customised parts, HellermannTyton also has teams of product developers at 12 locations designing plastic components for specialised applications. For example, a releasable clip for the easy wiring of inflight entertainment systems in aircraft seats or a spacer to prevent abrasion on the cables in wind turbines when they twist. HellermannTyton’s innovations are testament to the inventive spirit with which the company has always approached real customer scenarios. Two recently introduced products, the Ratchet P-Clamp and the RFID Cable Tie, are examples of how the versatility of conventional parts can be significantly increased and their field of application made smarter. Hi Sylvester Nong, due to our considerable development expertise, we are always able to design products that are perfectly tailored to your needs – whenever, wherever. We do everything under one roof, from planning to manufacturing.